Washington, DC – As President Trump continues his efforts to repeal the Affordable Care Act (ACA), U.S. 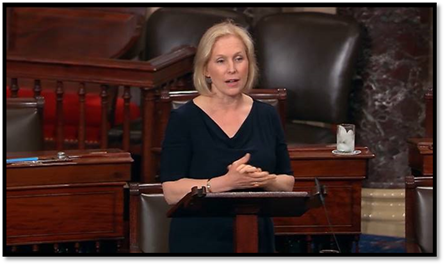 Senator Kirsten Gillibrand today took to the Senate floor to urge her colleagues to oppose the confirmation of Brett Kavanaugh to the Supreme Court of the United States. With a federal lawsuit challenging the ACA already underway, the next Supreme Court Justice could be the deciding vote on whether people with preexisting conditions continue to receive affordable health coverage. The ACA made it illegal for health insurance companies to deny coverage to people with preexisting conditions, expanding coverage to millions of Americans, including to more than eight million New Yorkers. As a judge, Kavanaugh was on record stating that, "the president may decline to enforce a statute that regulates private individuals… even if a court has held or would hold the statute constitutional." This would include the ACA and its protections for people with preexisting conditions, which the Trump Administration has already declined to defend in federal court. Gillibrand urged her Senate colleagues to protect the millions of Americans relying on the ACA for affordable health coverage by opposing Kavanaugh's confirmation to the Supreme Court of the United States. Mr. President, I rise to speak in opposition to President Trump's nominee to the Supreme Court, Judge Brett Kavanaugh. In my home state of New York, more than eight million people have health problems. That's almost half of my state. They're living with diabetes. They've had treatment for cancer. They have a childhood disease. Before the Affordable Care Act became law, if you had a health problem and you needed to see a doctor, health insurance companies were allowed to make you pay much more. The health insurance companies were allowed to turn you away – to tell you, "Sorry, you're not profitable enough for us because you're sick" – and they did it many times. And let's not forget that included women who were pregnant. But they can't tell them that anymore because of the Affordable Care Act. The Affordable Care Act made that simple statement illegal. Now, insurance companies must cover you if you're sick. They must cover you if you've had a health problem in the past. And millions of Americans are better off now because of that fact. So what does this have to do with the Supreme Court? President Trump has made it clear that one of his biggest goals as President is to destroy the Affordable Care Act. He's already tried hard to get Congress to repeal the law, and luckily for us, he failed. Because people don't want their health insurance taken away from them. Millions of Americans raised their voices and told Congress that if the Affordable Care Act got repealed, they would lose their insurance – and that would be devastating for them and their families. But now there is a new challenge to the law in federal court, and the Trump Administration is refusing to defend the Affordable Care Act. When this case makes it to the Supreme Court in a few more years, the next Supreme Court Justice could be the deciding vote in whether or not the Affordable Care Act is overturned. That means the next Supreme Court Justice could have the power to decide that insurance companies don't have to cover you anymore if you have a health problem. He could have the power to decide that insurance companies don't have to cover you or your child anymore if your child is sick. Health care costs in my state have already skyrocketed because of the fact that the Trump Administration has attacked this law over and over again. But repealing the law would absolutely be devastating to so many families. More than eight million New Yorkers could lose their health insurance or pay more for their coverage. So would millions more all across the country. And I am very concerned that that's exactly what Judge Kavanaugh would do if he was given this opportunity. Just look at his record. When Judge Kavanaugh had a case before him that was attacking another part of the Affordable Care Act, he dissented in the case, and he said that even though the Affordable Care Act requires employers to cover birth control medicines for their workers, they shouldn't have to do it if they don't want to. He even took it so far as to say that if the President doesn't like a law – if the President doesn't like a law – then the President could ignore the law and ignore the courts. Listen to this one opinion, Mr. President – this will interest you, I am sure – and tell me if you think this is sound judicial judgment. He wrote, "Under the Constitution, the president may decline to enforce a statute that regulates private individuals when the president deems the statute unconstitutional, even if a court has held or would hold the statute constitutional." Anyone with the most basic understanding of how the constitutional system of government works in this country knows that this is not what our Founding Fathers intended. If this judge is confirmed, then there is a dangerously high likelihood that he will strike down the Affordable Care Act. Mr. President, we must not go back to the days when an insurance company could charge more to a person just because they have health problems. We cannot go back to the days when an insurance company could say "No" to a patient because they could say, "You're just not going to make us enough money." We must listen to our constituents – listen to the millions of men, women, and children all across this country who need access to basic health care, and they cannot afford to lose their insurance. We must reject this nominee. I yield the floor, Mr. President, and suggest an absence of a quorum.